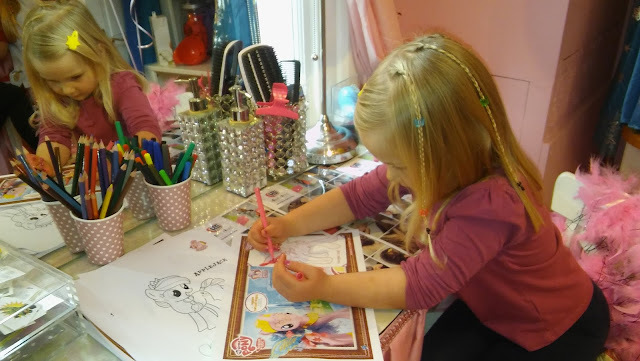 Holly is my little fashion diva at present and Fisher-Price Rainbow Dazzle Minnie is a fun toy to encourage her fashion creativity while learning about colours, matching and combinations. Holly has always been a big Minnie Mouse fan; there's something about her high heels and collection of spotty bows that fascinates Holly who has now started her own collection of high heels and hair accessories! Rainbow Dazzle Minnie Mouse is a free-standing hard light-up toy who speaks and sings. Press her hand to start the process of choosing a new magical outfit for Minnie Mouse. She will ask you to choose a colour for her bow, her dress and her skirt. Each time you touch her magical touchpoints, the colour of the light will change and Minnie will make a comment about the colour, or the combination of colours you have chosen. Once you are happy with Minnie's outfit you can press her hand to finish the outfit and Minnie will sing "True Colours" to you. The lights change through a range of colours - green, blue, yellow, white, purple, pink and red. Rainbow Dazzle Minnie also comes with a little camera-shaped toy which, when you look through it, shows all of the rainbow-coloured lights in sparkly wonder. Holly loves looking through the camera and even likes to look at other things around the house - even the television! I was worried that the entertainment factor of Rainbow Dazzle Minnie Mouse was very limited as she doesn't move when she sings and the range of phrases and music is very limited. However, Holly doesn't seem to mind the repetitive music and genuinely seems to enjoy the challenge of choosing a combination of three colours that offer a new fashion outlook for the day! Minnie's arms are poseable and even when she is not lit up, her pink dress has a pearlescent shimmer so she looks very pretty as an ornament on the shelf in Holly's room, even when she isn't singing. This Minnie Mouse Toy is perfectly suited to children aged 2-5 who want to explore colours and shapes and sing along with Minnie Mouse. Fisher-Price Rainbow Dazzle Minnie costs around £24.99. It is hard to go wrong with an Orchard Toys board game - they are firm favourites in our house. 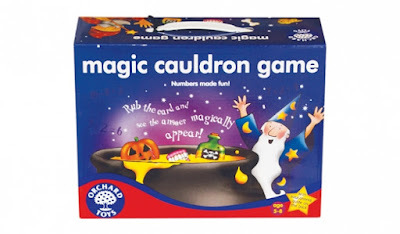 Orchard Toys wanted to get Lara and Holly into the magical halloween mood by sending us their Magic Cauldron game - a board and counter game packed with spooky spell ingredients and yet which tests their maths skills at the same time! The Magic Cauldron is suitable for 2-4 players and is recommended for children aged 5-8 years old. I think it is perfectly suited to Lara who is aged 6 and currently in Year 2 at school. Holly finds it fun, but very tricky and always needs our help but it is still a brilliant opportunity for us to help her learn about numbers, addition and subtraction. Each player takes a cauldron-shaped board featuring a witch or a wizard. The aim of the game is to fill your cauldron with spooky ingredients to make a spell. Each ingredient corresponds to a number and you have to identify a sum which results in that number. Most of the sums are very simple addition or subtraction with numbers upto 10 and it is a brilliant exercise for Lara to remember her number bonds. There are also a handful of very first multiplications and some additions which require three numbers. From eyeballs to stinky cheese, and bats to poison... each ingredient requires your child to search for a new sum. Holly uses it as a chance for her to recognise her numbers upto 10. We play with the girls and look to Lara to confirm that we have chosen the right sum to match the number but there is also another magical way that you can check that you have the right result... the ghost. Each maths puzzle has a ghost on the back. Rub the ghost very quickly with a warm finger to reveal the answer to the sum so that you can check it is correct. The girls both find this hard to do and will always ask us to do it - it does require a fairly vigorous rub! We have found The Magic Cauldron game to be a big test of concentration and observation for both girls. Lara is more than capable of the sums but with them all laid out in front of you, it does take a lot of concentration to spot the one you want. Despite this, the girls have come back to the game several times and I'm sure we will play it a lot more in the run up to Halloween. At £11.75 this board game from Orchard Toys is a bargain - lots of family time spent together having fun and (secretly) learning. Awesome stuff. Dora is one of my girls very favourite TV characters - both girls regard her fondly both in her original Dora the Explorer mode, and in her slightly more grown up Dora and Friends style. Unlike many TV characters, my two girls don't obsess about Dora, more that they respect her; they won't pester to watch and yet when Dora just happens to appear on the television, they sit quietly with smiles on their faces - quite unlike many of the other characters they know and celebrate. Dora and her puppy Perrito came to live with us and both girls have enjoyed playing with them. This Dora and Friends Train & Play Dora and Perrito doll from Fisher-Price features both Dora (in her more mature reincarnation) and her puppy who performs tricks and responds to Dora's commands. The Fisher-Price Dora and Perrito set allows your child to take Perrito for a walk, teach him to sit, lie down, dance and even high-five. Dora can speak commands to her dog and uses different arm movements to initiate new tricks. We were all impressed by the range of tricks that Perrito performs, and the range of phrases and songs that Dora speaks. Perrito is attached to Dora by a lead (without this attached, Perrito won't move) which somewhat limits their mobility but the girls do enjoy seeing him perform tricks on demand - they giggle if he falls over when trying to show off. Perrito also comes with a little toy which, if you wave it by his nose, encourages him to sit up and beg or perform a new trick. Holly enjoys taking Dora's shoes and clothes off as well as styling Dora's hair. Lara has taken it upon herself to try and get Dora to walk with her dog...this is particularly tricky because Dora is actually quite unstable on her own which is why both girls usually play with this toy together - one to hold Dora and one to perform tricks with the dog either by pressing the puppy design on Dora's top, or by moving her arm. There is now quite a range of available Dora and Friends toys; its nice to see Dora get a new lease of life. At around £35-£40 this toy is quite expensive for a role play doll but it will make Dora fans like Lara and Holly smile - especially when Dora and Perrito share a cute puppy kiss together! Note: Dora doesn't come with a hairbrush, the one in the photo is a toy Holly uses on all of her dolls! It has been a funny old week. 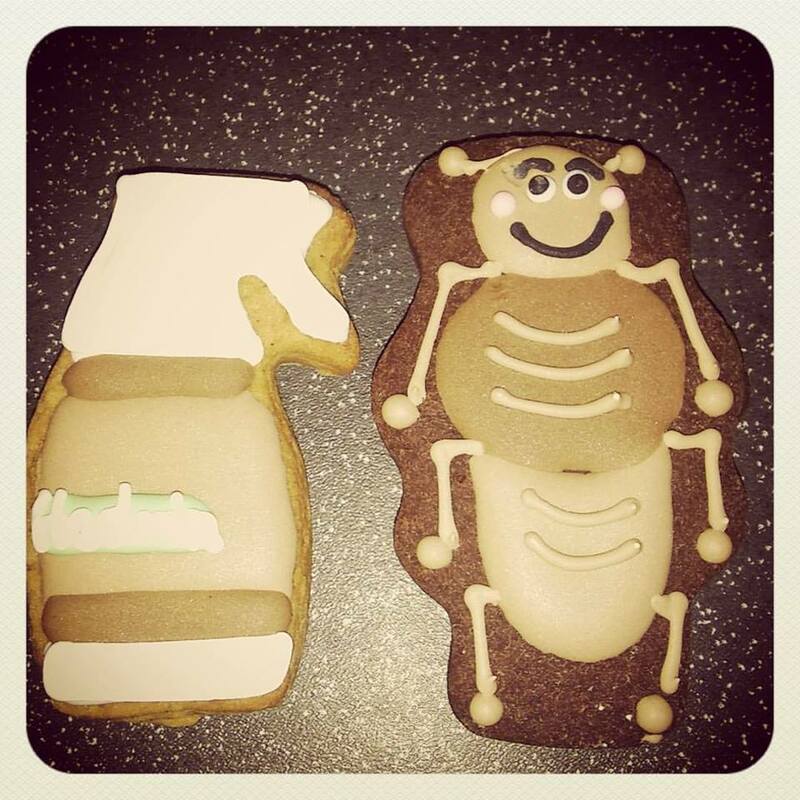 With a new job come some sacrifices - no more half day off work, no more school or nursery drop off, or pick up. One night this week I only just got home in time for snuggles with my girls before bed. These are all special times of day that I had been lucky enough to share with my girls in the past and this week I've really missed them. On the days when I have made it home at a more sensible time of night, we have chatted about the exciting things they have done at school and nursery and I've listened to them both read. Happy Times. This morning I woke up with the alarm at stupid o'clock for Holly's swimming lessons and the exhaustion of a new regime and a new job finally hit me. Mr. B. was lovely; he hopped out of bed and whisked Holly off to swimming leaving me and Lara snuggling together in bed. I was treated to a lie in. Unfortunately Lara wasn't tired any more and wanted to get up and get going. Sigh. She asked if she could borrow my iPad and then disappeared into her bedroom mysteriously. I will admit that I did drift back off to sleep, only to wake when Holly got back from swimming! What luxury. So, what was Lara upto on my iPad for an hour in such silence? Well, apart from playing matching pairs, she settled down to a couple of episodes of her favourite shows on Netflix. Lara is so independent now that she will happily browse Netflix on her own (with Kids mode switched on, I might add) and occupy herself. While I feel a little bit guilty for settling back down to sleep this morning, it does feel like a rare luxury to which I am indebted to Netflix! 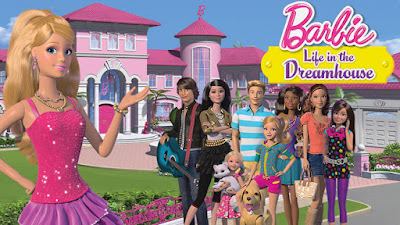 Barbie, Life in the Dream House is one of Lara's favourite shows right now. 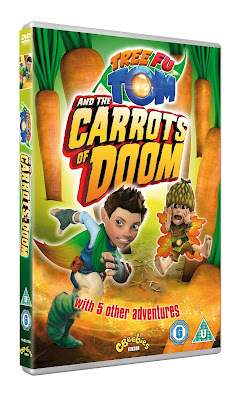 If, as an adult, you've never watched it before then I challenge you to sit and watch a whole episode. It is so surreal. It is a self-mocking Barbie programme based in Malibu and each show is made up of lots of quick-changing, parody sketches. When we first discovered it on Netflix, I think Lara was just drawn in by the pink-ness but now she is starting to pick up on some of the silliness and quite grown-up humour. 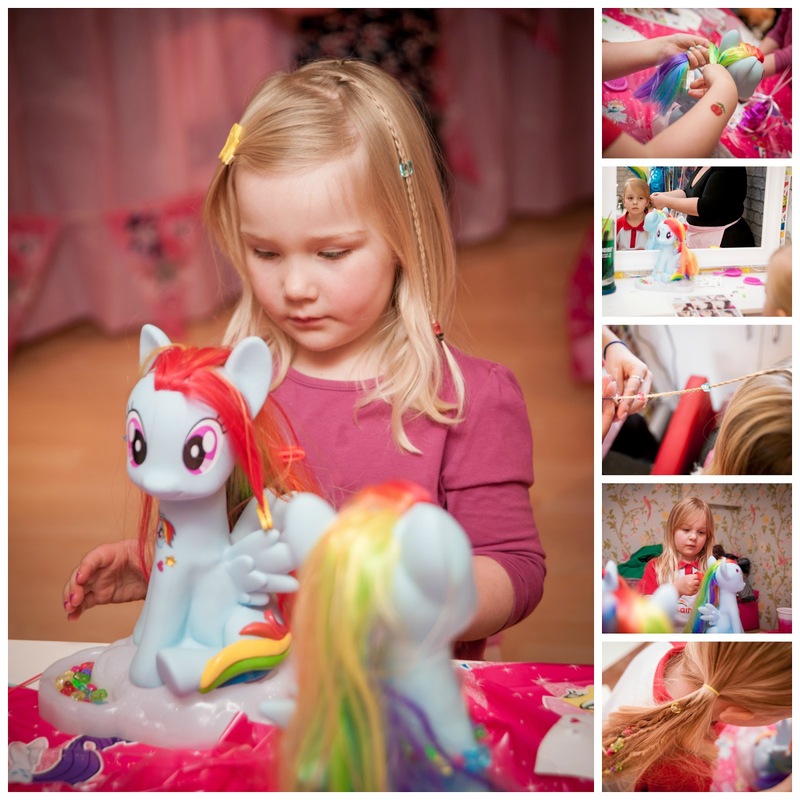 After the lie-in, I took the girls into London for a My Little Pony themed event. They both absolutely LOVED their day and came home very much enthused about My Little Pony so it was no surprise that the very first thing they asked to do when they got home was to watch some My Little Pony episodes on Netflix. 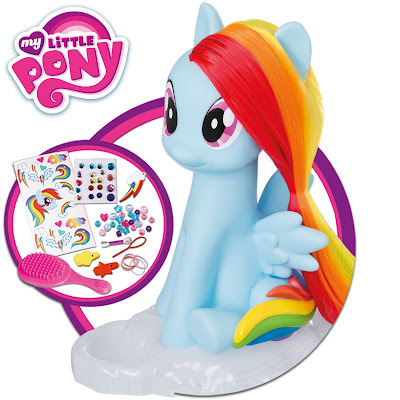 On Netflix there is a good range of My Little Pony series to watch ranging from 2005 episodes right through to the latest Friendship is Magic and Equestria Girls series which the girls seem to prefer. So now, after an exhausting day battling the crowds at Ascot and Twickenham with two enormous My Little Pony toys and two tired My Little Pony fans I'm settling back into bed as I'm home alone. I'm tucked up and ready to log onto MY Netflix account for the first time in a while - I'm ending the day with a little luxury, just like I started it. Tonight I'm starting to watch a new series that was recommended to me by friends who, like me, had also enjoyed Breaking Bad. 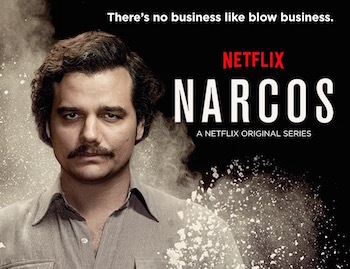 Episode 1 of Narcos... here I come. I often sit and simply watch my two beautiful blondies - their long, straight blonde hair mesmerises me, especially when we are out in the sunshine. 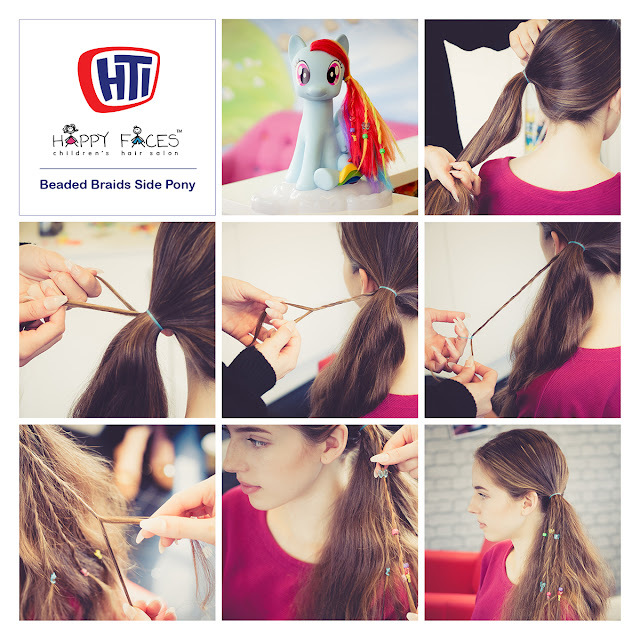 They've been blessed with gorgeous hair and I'm determined to help them keep it looking that way; clean and tangle-free. Lara, very seriously digestingthe instructions on her shampoo! 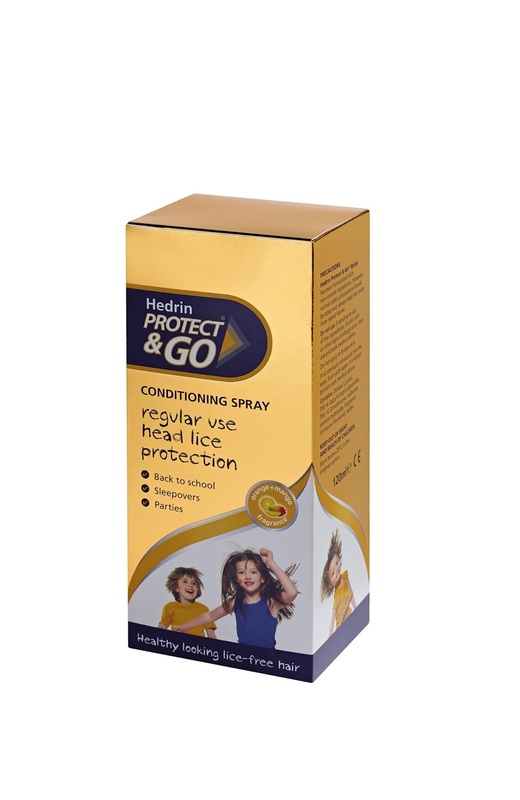 Over the past few weeks we have been using the Vosene Kids Fruity Goodness range of 2-in-1 shampoos which have recently received a packaging facelift. The girls are both great big fans of the Vosene Kids Strawberry 2-in-1 shampoo which has an intense strawberry scent which reminds me of milkshakes! 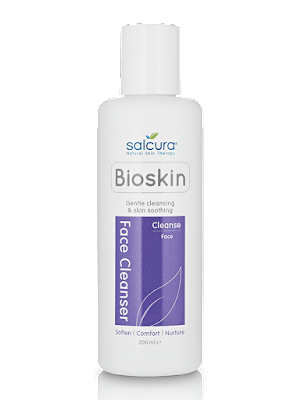 I was surprised to learn that these shampoos are paraben-free and MIT (Methylisothiazolanone)-free which would explain why the girls can use them without getting irritated skin - they do both still on occasion experience dry itchy skin from bath products. I'm really happy with this shampoo for the girls but I'm still a little confused about what the 2 in the 2-in-1 label really means as it isn't clear from the label. Traditionally I'd expect a 2-in-1 shampoo to offer both shampoo and conditioner so that I don't have to use two separate products but I certainly still find that both girls need to use a conditioner after this if I am to get a comb through their hair without tears. Also in the fruity goodness range is the Vosene Kids Melon 2-in-1 Shampoo which promises soft and shiny great-smelling hair. I much prefer the scent of this shampoo as the melon smell it is a little more sedate and fresh smelling. It is a mild shampoo which Holly doesn't seem to mind if it accidentally washes into her face when I'm rinsing her hair. I think both of these Vosene Kids Fruity Goodness shampoos are great everyday haircare solutions for kids - they are easy to find on supermarket shelves. Both Lara and Holly have very much been enjoying their autumnal crafts together at the weekend. 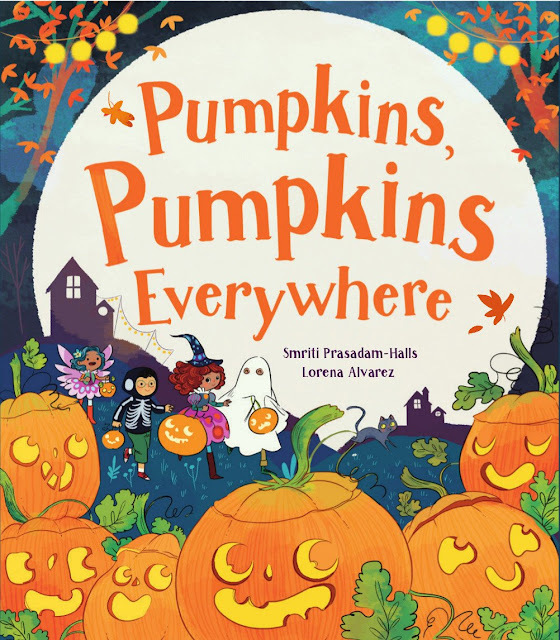 At this time of year we start looking forward to Halloween; it isn't a day that we particularly celebrate at home or at school but the idea of spooky goings on and "frights" is very much encouraged as a theme to explore at this time of year. Yellow Moon sent the girls a selection of halloween craft activities which are perfect for the run up to half-term and would all make wonderful activities for a halloween party with friends from school. One of Holly's favourite things to do is sticker-craft as she can now do this independently. With a bumper pack of glitter foam stickers and a pack of plain black paper, Holly was able to make fun, striking images. The foam stickers have lots of small parts to pop-out for the most striking effect and Lara was better suited to this element of the activity. These spider finger puppet kits come in a pack of 4 and make a variety of designs - I think they'd be perfect at any time of year but they do seem very fitting right now! The girls had great fun performing a spider-show for me after they had made their spider puppet kits. The girls had most fun with these simple halloween foam stampers which come in the same designs as the foam stickers so that you can make co-ordinating halloween crafts. From cauldrons to skulls, pumpkins to witches, these chunky hand-held stampers work well with paint or ink on autumnal coloured card and paper. We played outside in the garden with these paints so that we could collect fallen autumn leaves to stick onto the pictures as well. Yellow Moon stock a massive array of halloween themed craft activities and craft essentials such as these but you may be surprised that they also stock party bag fillers which make great ideas for trick or treat surprises on the night. One of the problems about blogging my reviews of beauty products is that the interweb has yet to invent the means of me transmitting the smell of the products I review. And that's an issue because I find it hard to put into words quite how heavenly the scent of the new Rose and Frankincense bath and body range, Humble. 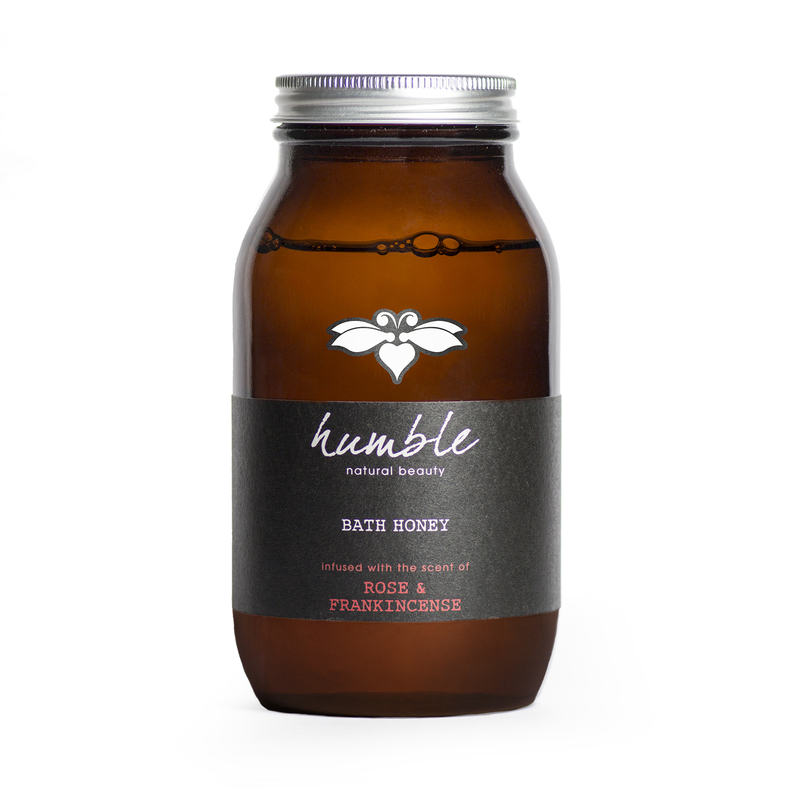 It has been a couple of years since I've tried a bath product (for me) which has blown me away; but the Humble Rose and Frankincense Bath Honey brought a massive smile to my face! It is a gorgeous, pampering, relaxing, mellow bath additive which made me, and the entire bathroom smell fabulous. And what's more, this luxurious range of bath products launched by TV's Kate Humble, has guilt-free green credentials. I don't normally set much weight on a celebrity name when it comes to cosmetics but I understand why Kate Humble might seek to launch a natural and biodegradable range of cosmetics - somehow her name makes the brand seem genuine. All of the ingredients in the Humble range are sustainably sourced and are chosen such that, when the products are used and then washed away down the drain, they have minimal impact on our waterways. Of course, the range is also free from SLS and parabens but importantly, where ingredients can be sourced in the UK, they are... this helps reduce the "beauty miles" of your cosmetics. The Humble eco-friendly natural beauty range is available exclusively in Waitrose and features bath and body products in two different scents - Rose and Frankincense, and Sweet Pea and Verbena. 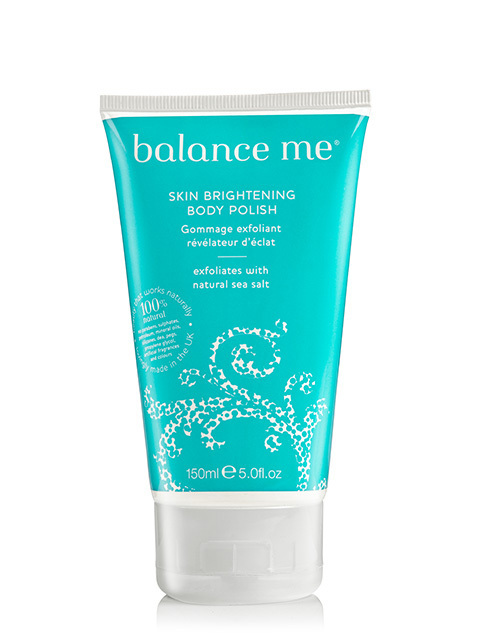 Both fragrance ranges feature a handwash, hand lotion, body lotion, body wash and intense hand cream. I was lucky enough to try out the luxurious Rose and Frankincense bath honey which is a sweet-scented runny bath foam. For an SLS-free product it produces a great foam. The bath honey comes in a large (300ml) jar with a screw top lid. It looks luxurious, it smells luxurious and trust me, when you shut the door and shut out the world for your own rose-scented bath, it feels luxurious. 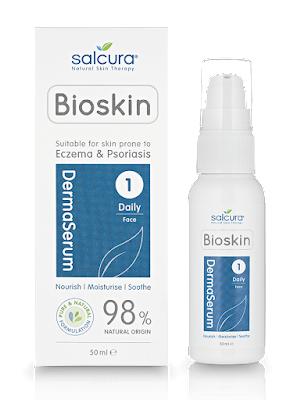 I LOVE, LOVE, LOVE this product and it has definitely made me want to try out the other products from the Humble range.